GIVEAWAY: The Decent of the (Post)Modernitst? GIVEAWAY: The Descent of the (Post)Modernitst? Home / latest / GIVEAWAY: The Descent of the (Post)Modernitst? I need help updating this picture! It is taken from William Jennings Bryan‘s attack on ‘modernist’ religion which he believed was undermining the foundations of society. As much fear as it is sure to put in your hearts, when you get done repenting for listening in biology class I would love to hear what you think about updating the stairs of descent. What are the stairs labeled today? Should they even be stairs? Should they being going down? 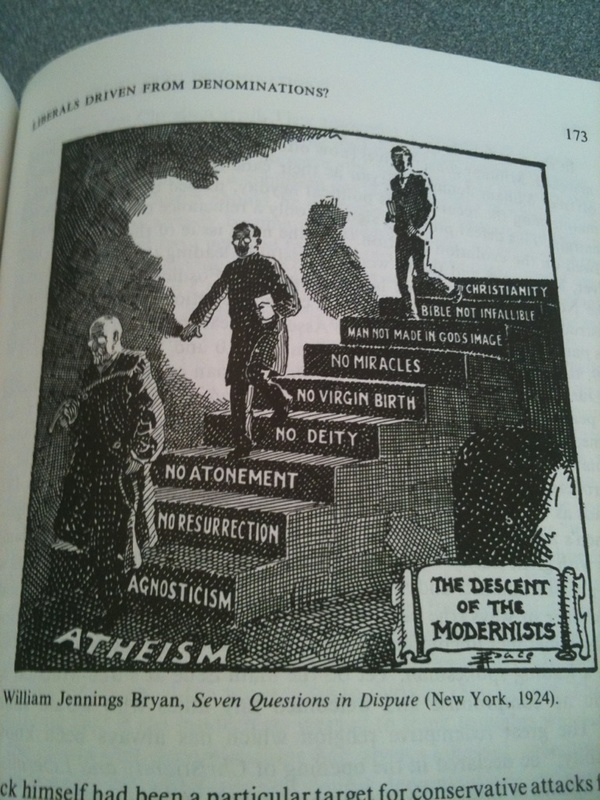 This descent is how Bryan understood the Modernist decent into religious, moral, and cultural relativity. I have some theology books and Homebrewed stickers to giveaway for those who help me come up with a new rendering! So Deacons lend us your creativity. Now for a word from Mr. Bryan…. Is the Bible true’? That is the great issue in the world today, surpassing in importance all national and international questions. The Bible is either true or false it is either the Word of God or the work of man. If the Bible is false, it is the greatest impostor that the world has ever known . . . .
As there can be no civilization without morals, and as morals rest upon religion, and religion upon God, the question whether the Bible is true or false is the supreme issue among men. As the Bible is the only book known to the Christian world whose authority depends upon inspiration, the degradation of the Bible leaves the Christian world without a standard of morals other than that upon which men can agree. As men’s reasons do not lead them to the same conclusion, and as greed and self-interest often overthrow the reason, the fixing of any moral standard by agreement is impossible. If the Bible is overthrown, Christ ceases to he a Divine character, and His words, instead of being binding upon the conscience, can followed or discarded according as the individuals convenience may dictate.